Hadoop Summit 2013 Amsterdam – It’s A Wrap! We want to take a moment to thank everyone who attended the Hadoop Summit in Amsterdam – THANK YOU! With nearly 500 people registered for the event we think we can safely say is was a big success. We’ve had overwhelming support to do it again next year – so watch this space. 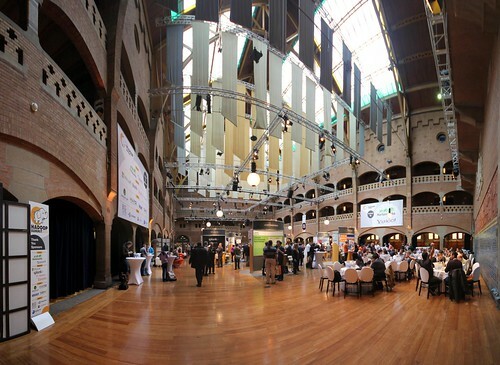 The awesome Beurs Van Berlage venue set us up for a series of fantastic conversations and really well attended sessions and talks as Hadoop continues to explode onto the enterprise scene . Outside of the main tracks, there was great attendance for NLHUG and BoF talks, and kudos to the 10 presenters who ran those lightning talks. Finally, the customer panel was also well received, with great practical advice on adopting Hadoop from HSBC, Neustar and eBay. So did you enjoy the summit? Head over to Facebook and let us know your favorite part and why: keynotes, tracks, lightning talks, the sandbox experience in the dev cafe, or the party. With the community voting just about complete – you still have a few hours to take part – for Hadoop Summit San Jose we are barely 3 months away from a whole bunch of new content and connections and we hope you join us there too!